John Deere fenders work with all X700 Signature Series models, and they can help contain debris and prevent it from flying up toward the operator as he or she works. The front bumper is compatible with the 100 Series, S240 Sport, X300 Select Series, and X500 Select Series. This can prevent front-end damage and increase the machine’s overall durability. The X300 Select Series, X500 Select Series and X700 Signature Series are all compatible with the front brushguard, which prevents the front end of the tractor from brush damage. The Foot Lift Kit can be used with the EZTrak™/Residential ZTrak™ mowers. 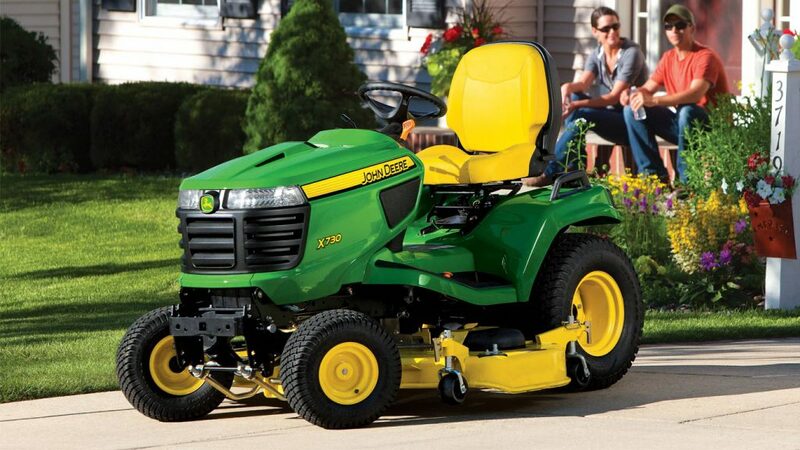 It allows operators to raise or lower the mower deck without the use of hands. Floor mats are also compatible with the EZTrak™/Residential ZTrak™ mowers, which protect the foot deck of the mower over time. The Light Kit can be utilized with the EZTrak™/Residential ZTrak™, X300 Select Series, X500 Select Series and X700 Signature Series mowers. It allows operators to illuminate their working area at dawn or dusk for even more productivity. The 100 Series, X300 Select Series, X500 Select Series and X700 Signature Series all work with the sun canopy, which provides some much-needed shade on warm, sunny days. The footrest extension kit can be used with EZTrak™/Residential ZTrak™ mowers to provide even more comfort while operators work. The Deluxe Seat that can be used with the X700 Signature Series offers more back support and plush seating for additional comfort on the job. The rear bumper/attachment bar is compatible with the S240 Sport, X300 Select Series and X500 Select Series. It guards against potential damage in the rear of the machine for peace of mind. The S240 Sport, X300 Select Series and X500 Select Series can all use the Seat Net Kit. It easily attaches to the back of the tractor seat for additional storage on the go. The X300 Series, X500 Series and X700 Signature Series can all utilize the phone charging kit, which keeps phones juiced while on the job. If you have any questions about John Deere lawn tractor accessories and attachments, you can contact your local John Deere dealer.